Mia Hamm is a former American soccer player who won the Women's World Cup twice. Check out this biography to know about her childhood, family life, achievements and fun facts about her. Mariel Margaret Hamm-Garciaparra, popularly known as Mia Hamm, is a former American soccer player who won the Women's World Cup twice and is also a two-time Olympic gold medalist. She played in the US women's national soccer team for 17 years, and held the record for most international goals scored till June 2013. Named FIFA's World Player of the Year for two consecutive years, Hamm was also elected Soccer USA's Female Athlete of the Year for five consecutive years. She was the face of the first professional women's soccer league in the US as well. Currently, she holds the third position in the history of the US national team for international caps (276), and the first position for career assists (144). Named the Sportswoman of the Year for two years by The Women's Sports Foundation, she is the first woman to be inducted into the World Football Hall of Fame. 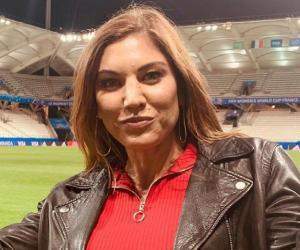 She is the co-owner of the Major League Soccer team, Los Angeles FC, and the global ambassador for Barcelona FC. She was also named to the board of the National Soccer Hall of Fame in 2014. 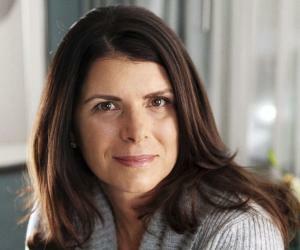 In addition, she is the founder of the Mia Hamm Foundation for bone marrow research. Mia Hamm was born on March 17, 1972, in Selma, Alabama as the fourth child of Air Force pilot Bill Hamm and Stephanie. Throughout her childhood, she and her family stayed at various United States Air Force bases around the world. She has five siblings. She played soccer for the first time when she and her family moved to Florence, Italy. At Texas, she joined a soccer team for the first time. Her father coached her and her adopted brother Garrett. While she was at the junior high school, she excelled as a football player in the boys' team. She also played soccer for the Notre Dame Catholic High School in Texas. In 1987, at the age of 15, she debuted for the US women's national soccer team, and played at the US Olympic Festival. She was then the youngest player in the US women's national soccer team. When she attended the Lake Braddock Secondary School in Burke, Virginia, she helped its soccer team win the 1989 state championships. She attended the University of North Carolina at Chapel Hill with a scholarship from 1989 to 1994, and helped Tar Heels women's soccer team win four NCAA Division I Women's Soccer Championships. In 1991, when Mia Hamm played at the FIFA Women's World Cup in China, she was just 19 years old and was the youngest player in the team. In the first match, she scored the game-winning goal, and led the team to a victory. They won the semi-final against Germany, and took the first World Cup championship title after defeating Norway in the final. In her second World Cup tournament in 1995, she scored a goal, but the match against China was a draw. The US team won the second match against Denmark. They defeated Japan in the quarter-final, but lost to Norway in the semi-finals. During the 1996 Olympic Games in Atlanta, the first Olympic tournament to include women's soccer, the US team won against Denmark, Sweden, and Norway. During the final match against China, Hamm was injured and taken out of the field in the final minute. Nonetheless, the US team won their first Olympic gold medal. In 1999, with her 108th goal for the US team, she set a record for scoring most international goals, breaking the record set by Italian player Elisabetta Vignotto. Hamm held the record till June 2013, when American player Abby Wambach broke it. During the 2000 Olympics in Sydney, she scored a goal against Norway and the US team won the game. They defeated Nigeria, and in the semi-finals, Hamm scored the game-winning goal against Brazil, which helped her to set a record for most goals scored in international play by a woman or man. However, the US team was defeated by Norway in the final, and they earned the silver medal. In 2001, she played in the Women's United Soccer Association (WUSA), the first women's soccer league in the US, as a founding player. From 2001-03, she played for the Washington Freedom. Throughout the league's history, she was acclaimed as the star of the league. In July 2004, during a game against Australia, she scored her 151st international goal, and set a record for most international goals scored by any player in the world, male or female. She held the record till 2013. Hamm announced her impending retirement on May 14, 2004, at the age of 32. She played her last international match in December 2004. Over the course of her career with the US women's national soccer team, she played 42 matches in international tournaments, and scored 14 goals. She made 276 appearances with the US national team. She played in four FIFA Women's World Cup tournaments—in China (1991), Sweden (1995), and the US (1999, 2003). She led the team in three Olympic Games—1996 in Atlanta, 2000 in Sydney, and 2004 in Athens. While playing for the Tar Heels women's soccer team, Mia Hamm was named the Atlantic Coast Conference Player of the Year for three consecutive years and the ACC Female Athlete of the Year for two consecutive years. The Women's Sports Foundation named her the Sportswoman of the Year in 1997 and 1999. In 1999, Nike named the largest building on its corporate campus after Hamm. In 2000, FIFA Female Player of the Century Awards named her as one of the top three female soccer players of the 20th century. 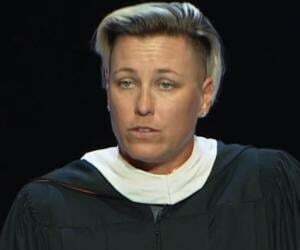 She was also elected as the US Soccer Female Athlete of the Year for five years—from 1994 to 1998. She won three ESPY awards including the Soccer Player of the Year and Female Athlete of the Year. In 2004, she was listed in the FIFA 100 as one of the greatest living soccer players. In 2006, she was inducted into the Alabama Sports Hall of Fame, and into the Texas Sports Hall of Fame in 2008. She was selected for induction into the National Soccer Hall of Fame in 2007. In 2013, she was inducted into the World Football Hall of Fame. In the same year, she was named US Soccer's USWNT All-Time Best XI. She received the Golden Foot Legends Award in 2014. Mia Hamm married Christiaan Corry, a US Marine Corps helicopter pilot, in 1995; they divorced in 2001. She married Boston Red Sox shortstop Nomar Garciaparra on November 22, 2003. They have twin girls—Grace Isabella and Ava Caroline, and a son Garrett Anthony. She has authored the national bestseller ‘Go For the Goal: A Champion's Guide to Winning in Soccer and Life’, and the fiction ‘Winners Never Quit’. She founded the Mia Hamm Foundation after her adopted brother Garrett died in 1997 due to aplastic anemia, a rare blood disease. The foundation spreads awareness about bone marrow diseases, and also raises funds for people who need bone marrow transplants. It also creates opportunities in the field of sports to empower women. During her soccer career, she had endorsed brands like Gatorade, Nike, Dreyer's Ice Cream, Pepsi, and several others. The magazines ‘Sports Illustrated,’ ‘Time,’ and ‘People’ have featured her on their covers. She was also seen in several television shows like ‘Good Morning America’, ‘The Oprah Winfrey Show’, ‘Late Night with David Letterman,’ and many others. ESPN SportsCentury and Biography have profiled her.